These are the last days of Mal’s spring vacation and she plans to spend them as nicely as possible. She went back home for a couple of days to keep her mom company and she totally forgot that this weekend we celebrate Mother’s Day. She wants to surprise her mommy with a delicious breakfast and she’s relying on your precious helping hand. Hurry up and get this super fun holiday themed game for girls started and help Mal deal with her surprise before her mom wakes up. In order to prepare the healthy breakfast Mal has in mind for her mother, you’ll have to firstly cook the eggs. There are some special tools we brought in order to come up with a funky look for Maleficent’s favorite fried eggs, so make sure to use them according to Mal’s precious instructions. Next, prepare a delicious juice as well. She likes her green drink to be mixed with ice cubes and gummy worms, so don’t forget to put enough of each. Next you get to dress up both mother and daughter in some elegant outfits so that they can celebrate Monther’s Day in style. 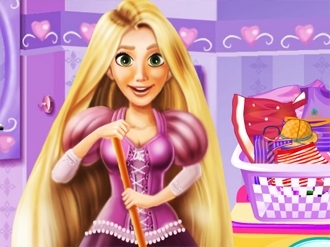 Today Rapunzel have a housekeeping duty .Help her use the washing machine and separate the clothes,the white from the black and wash them separately.After she finishes washing the clothes you can help her ironing them.Have fun playing with Rapunzel! We all know the story of beautiful princess Rapunzel, but not so many people have seen her as a modern woman. So you are going to have the amazing opportunity to join her for a whole pampering day at the spa!